A little while ago I went to New Orleans with some friends for the weekend. I love New Orleans. It's one of my favorite cities. I love the history, the architecture, the food, and their drinks! I can do without the humidity, but that just makes the drinks taste that much more refreshing. It was my best friend's birthday, so we started the celebration by having some drinks at one of our favorite spots, Pat O'Brien's. 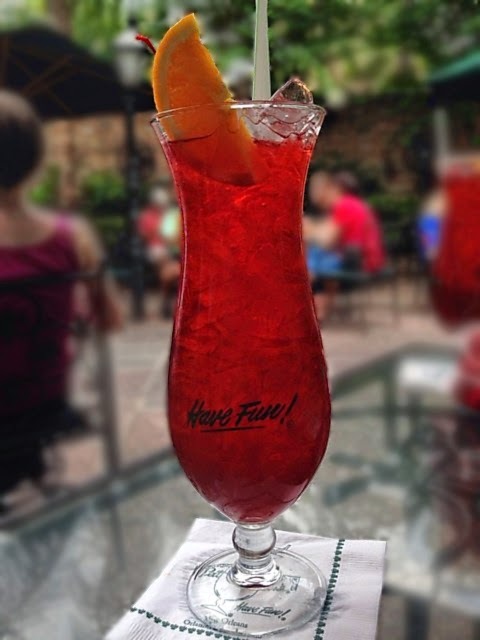 My favorite drink at Pat O'Brien's is their Hurricane. It tastes just like fruit punch and they go down easy. Almost too easy. Some other drinks we had at Pat O'Brien's were the Rainbow and Planters Punch. The Rainbow is a colorful drink of Grenadine, Vodka, Blue Curaçao and Pat O’Brien’s® Sweet & Sour Mix. 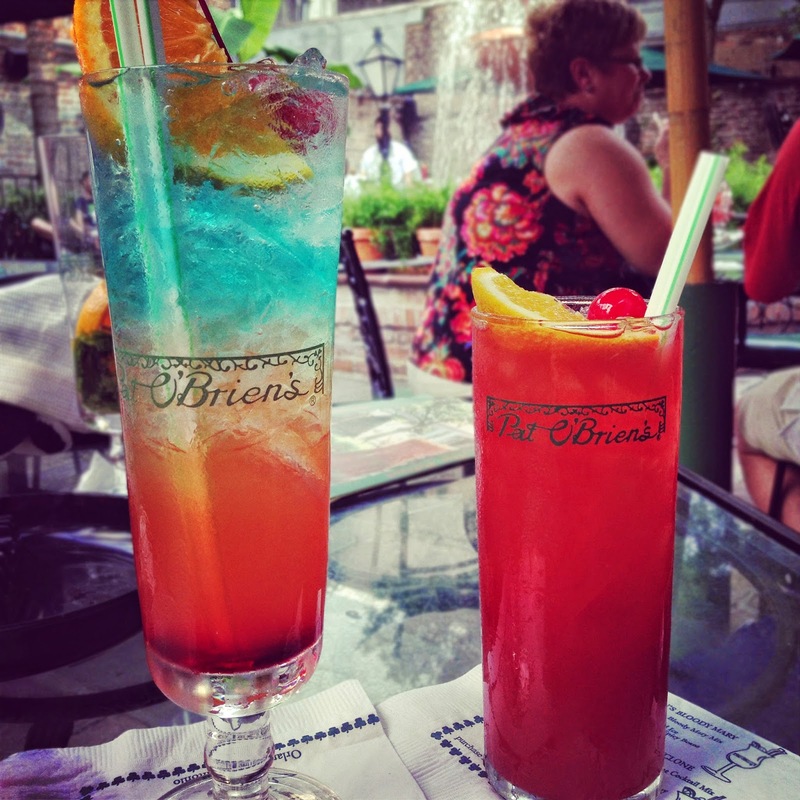 Pat O'Brien's has a large selection of other great drinks that will quench any thirst on a hot summer evening. For dinner we went to one of our favorite restaurants, Desire Bistro and Oyster Bar at the Royal Sonesta Hotel. I couldn't decide on just one dish, so I ordered the Creole Trio. It's a combination platter of gumbo, jambalaya, and red beans and rice with smoked sausage. It all tasted great! After a good night of great food and drinks, we had breakfast at Vacherie on Toulouse Street at the corner of Dauphine. I ordered the Andouille Hash. It comes with local Andouille sausage, diced potatoes, diced onions, red peppers, green onions, topped with poached eggs and Hollandaise. I ordered a fresh biscuit on the side. I love Andouille sausage, and this hash tasted like authentic New Orleans. You can't visit New Orleans without stopping by the famous Cafe Du Monde. You have to try their Beignets. They are square French-style doughnuts. They can be ordered plain, or as most do, covered with heaps of powdered sugar. Be prepared to have your face and most of your clothes covered in powdered sugar! The original Cafe Du Monde coffee stand was established in 1862 in the New Orleans French Market. The Cafe is open 24 hours a day, seven days a week. Another one of our favorite places in New Orleans is Cafe Amelie. It is located in the historic 150-year-old Princess of Monaco Courtyard and Carriage House on Royal Street. It has a beautiful courtyard for dining, and a great bar that serves a delicious Pimm's Cup. Like the Hurricane, a Pimm's Cup is very refreshing on a hot summer day. After breakfast, we strolled around the French Quarter and popped into the Touche Bar for a Bloody Mary. The Bloody Mary was tasty with just the right amount of spice. It was the perfect drink before heading back to the airport to catch our flight back to Seattle. If you haven't been to New Orleans, I highly recommend it. The city is rich in history and has a long history of great food. I hope to visit back again to try even more great food!